Harris has been conducting testing services since 1958. We were in fact the nation's first accredited soil-testing laboratory. Today we serve clients in all 50 dates and 38 countries. We offer a wide range of services, including soil analysis, plant tissue testing, organic soilless growth media and other specialty testing. We are one the few laboratories to employ a Ph.D. chemist and all of our agronomists are certified. Support staff is accessible by phone or internet, for answering question and problem solving. We can walk through your analysis report and help you develop and effective fertilizer and application programs. Harris consistently ranks first in accuracy according to numerous outside proficiency testing programs. Laboratory data and interpretation are presented in easy-to-read formats that are specifically developed for the turf industry; soil-plant-water and growth media. You can download your PDF report from the Internet or we can send directly to your email account or both. It’s flexible for your convenience. 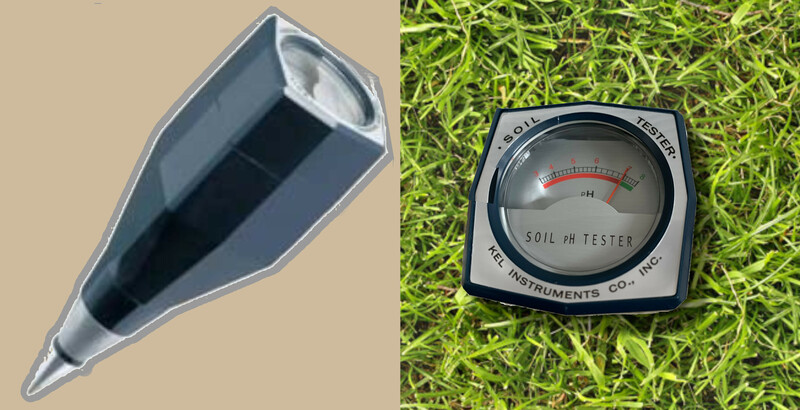 Increase Productivity by Controlling Soil Acidity with a direct reading soil tester. Tests soil in 3 minutes! Only 6.5" long - Weighs 8 oz. The pH tester operates on the principle of electrical potential between two dissimilar metal plates - without batteries or any external power source. When inserted into moist soil the HB-2 registers degree of acidity on the upper scale. The lower scale shows degree of moisture (% saturation) when the switch button is held depressed. Why test for Soil pH? The nutrients that support growth usually cannot dissolve in very acid or very alkaline soil moisture. If they can't dissolve, they can't be used for growth even if they are present in the soil. Normal beneficial soil bacteria which promote necessary soil enrichment are unable to survive in very acid or very alkaline soil. pH is an ongoing and ever changing phenomenon. Most soils drift to the acid condition and need regular evaluation so that they can be controlled and productivity increased. Proper pH makes a tremendous difference in soil's ability to absorb nutrients. Click here to see how pH affects macro-nutrient availability. Why choose a direct reading Soil Tester? Laboratory glass electrode pH meters require buffer solutions, temperature control, power sources, clean equipment, and are both fragile and expensive. Soil brought to a laboratory for testing often changes pH en route before it can be tested due to CO2 losses, and you must wait for results. A direct reading tester goes with you. It is portable, rugged, convenient, operates without a power source and is not overly sensitive to temperature variances.